Just in time for spring, outdoor enthusiasts can celebrate the approaching good weather with the kickoff of Venture Vermont. The challenge is a great way to get outside and enjoy the outdoors, and anyone can participate. Activities this year will include riding bikes, hiking, skipping stones, fishing, bird watching, and going on a day-long outdoor adventure. The rules are pretty simple. Here's how it works: Download a score sheet (online PDF) Do fun outdoor activities listed on the score sheet between April 01, 2017 - October 15, 2017 Take photos of your activities When you reach 250 points, submit your score sheet and photos to us Receive a VIP gold coin, good for free state park entry for rest of this year and all of next! Have a blast! If you are doing the challenge as a family, you can take group photos, but each family member needs their own score sheet. Recently, the Travel Channel asked us to name our most adventurous state park. We had a hard time because there is plenty of adventure to be found in Vermont's 55+ state parks. Should we pick Mt. Ascutney for it's hang gliding? Jamacia for its whitewater paddling? Or Green River Reservoir or Woods Island for its remote paddle-in camping? The Appalachian Trail runs through Gifford Woods State Park, there is gold panning at Camp Plymouth State Park. Branbury has rockclimbing cliffs, And the list goes on. 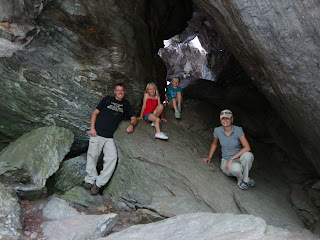 We were only allowed to choose one, so we settled on Smugglers' Notch State Park. Named after an infamous route used to smuggle illegal goods across the US-Canada border, Smugglers Notch State Park has an adventurous past and present. Located at the base of Mount Mansfield, Vermont’s highest peak, the park is part of the much larger Mt. Mansfield State Forest. 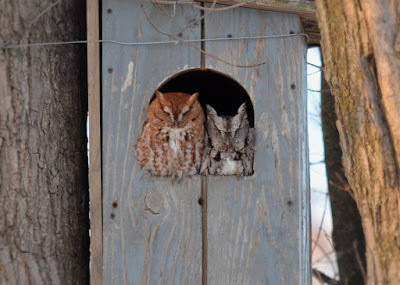 Recently spotted in Poultney, a nicely matched pair of Eastern Screech Owls. When hatched, these owls are covered in white down, but the adults come in several different color morphs: red, grey and brown. We always enjoy when nature provides such a convenient visual/ educational aid! Eastern screech owls are common east of the Rockies. The red color morph is common in the eastern part of its range, but becomes much less common as you travel west into the great plains and towards the Rocky Mountains. In south Texas, the red color morph is almost unknown.